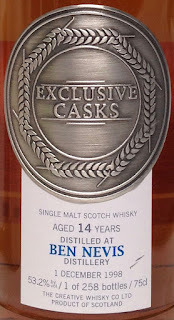 To start off the dozen-review run of Ben Nevis single malts, I'm going to revisit the first Ben Nevis I reviewed on this site. The whisky left me saying, "This is really......What is this?" In a good way. 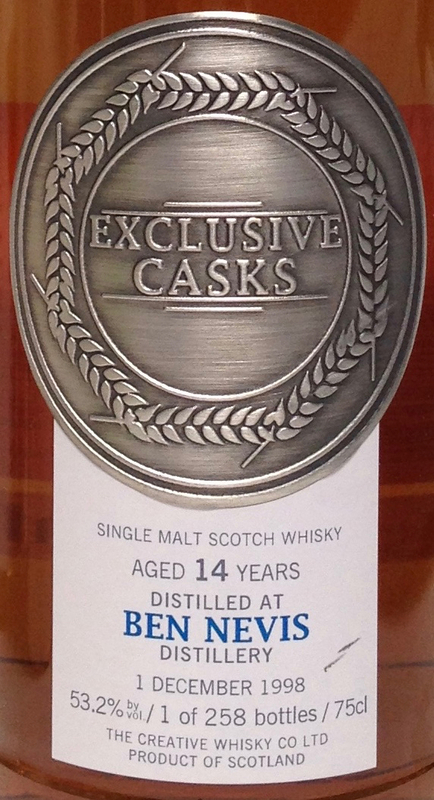 In fact it might be my favorite single cask bottled by David Stirk's outfit. The first time I tried it, I thought it was from a sherry cask. Later I did not. Now, I dunno. But I do like me some strange. With all the wisdom I have gained, or (mostly) lost, over the past three and a half years I shall now consume this whisky once more. While there's some rich wood character in the nose, it gets relocated to the background. Up front it's barley and burnt plastic meets roses, oranges and fruit candy. It all gets prettier with time. The aromatic palate has raspberry jam, oranges, sea salt and something that's like a combination of fudge, honey and nutmeg. There's a reliable dingy, almost smoky, note throughout. In fact, things get smokier and maltier with time, while picking some peach and bitter notes too. It finishes with orange, fudge, vanilla and a hint of smoke. It gets grassier and spicier with time. A different creature. The nose is all plastic toys, new book ink, newspaper print and new dollar bill. Meanwhile the palate has gotten silkier and creamier. Hints of ink and smoke. But also limes and a peachy pudding. It finishes with limes, peaches, smoke and vanilla bean. Idiosyncratic and delightful. ←←← a phrase I'll probably use all month, thus rendering the word 'idiosyncratic' indistinct. More to the point: I've now listed five different tastings of this same whisky on this site, and while the same notes appear throughout, they show up at slightly different times, combinations and strengths. Yet, the whisky is always very good. This time, I liked the palate better than the nose, when neat. But the diluted nose's transformation was a hoot! Loved it. Laser Wolf speculated, in the comments section of the bottle's previous review, that the cask could have been some active US oak that held some funky French wine. I might even second that. Or...... it's Ben Nevis being Ben Nevis? A harbinger of Ben Nevis reviews to come? Jordan at Chemistry of the Cocktail enjoyed this whisky's balance and complexity too. It's a good 'un.